This post covers a Modern, fresh approach to managing and communicating policies across an organization. I’ll walk thru a practical example of provisioning an organization-wide Modern Policy Hub to surface all active policies by leveraging a standardized Information Architecture, modern Policy sites and pages along with modern search to summarize policies by category. 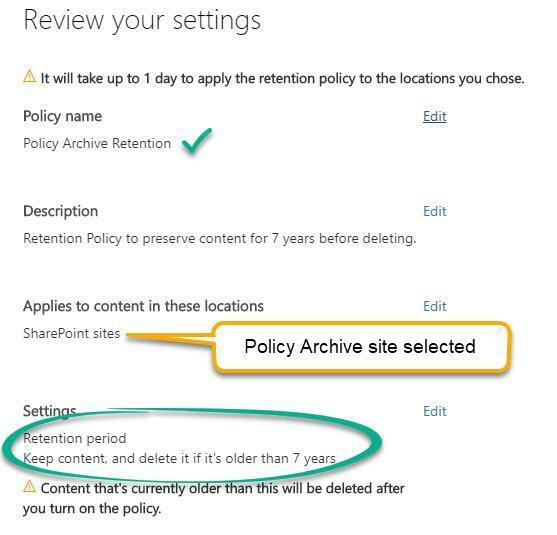 And because we only want active policies to show, all expired policies will be automatically moved to an archive location to kick-off retention. This is the modern way of communicating and archiving policy! If you’re a Power user in SharePoint, you can build this! Follow along to learn how. This is not intended to replace a full-blown policy management tool; however it goes a long way in surfacing active policies to staff in an easy-to-build, scalable way, allows for retention to be applied, and can be customized for more stringent requirements. Although this solution uses modern pages, you could build the same solution using documents. Using a modern Communication site as the template, provision a new site called Policy Hub. Identify this site as a SharePoint Hub so all other policy sites can be joined to it. This solution requires each policy to be represented by 1 policy page (you could also use a document to represent each policy). Each policy page will have an effective and expiry date (if known) set on each page by editing the page properties. These dates are what will determine whether a policy is active. 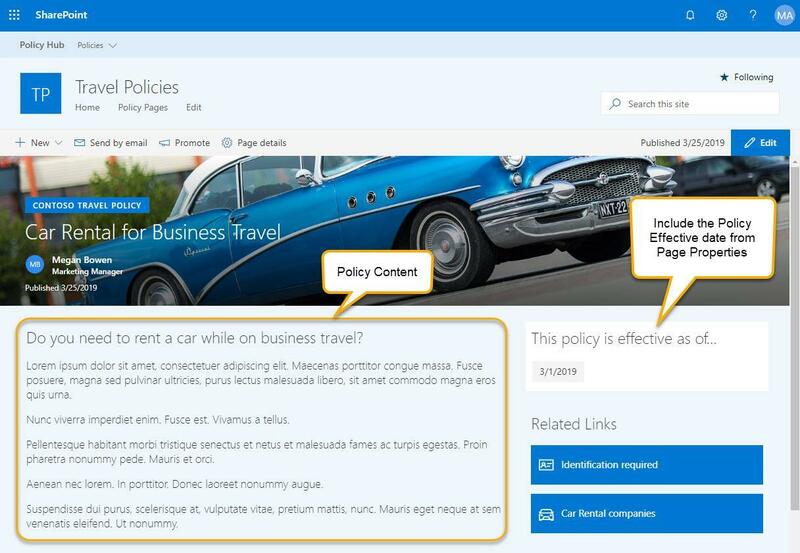 To take advantage of the “Copy of this page” menu option, build your first policy page with a standard and consistent format, including the Page Properties web part, and then make all subsequent policy pages based off that. This saves time and will provide a consistent look and feel across all policy pages. If you are using documents instead of modern pages… take advantage of the new document template feature to provide a consistent look to a policy document. Here’s an example of a Policy page I built and what I will use to create all other Policy pages from on each site. Note that it includes the Policy effective date using the Page Properties web part. 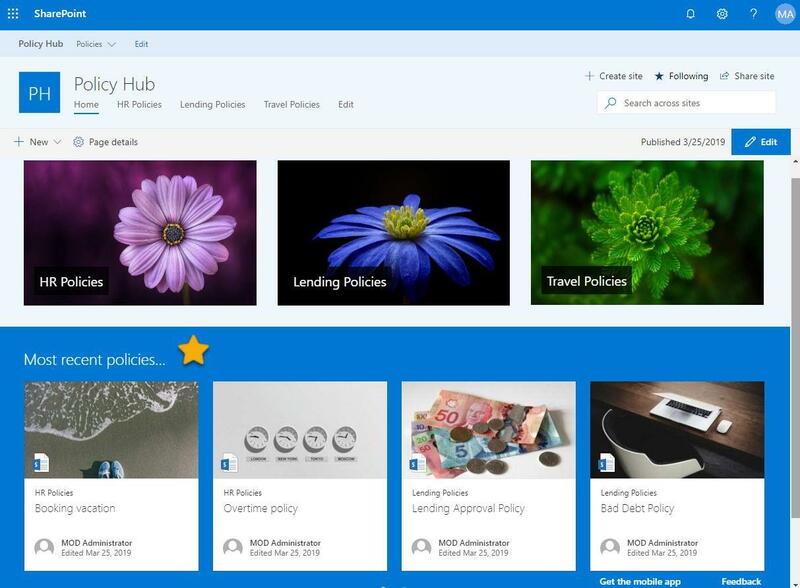 On the Policy Hub site, build a home page to show a thumbnail image for each of the 3 types of policies (HR, Lending, Travel in my case) with links to each of the 3 modern pages summarizing the policies of that type. Also, add a Recently added policy section using a Highlighted Content web part showing the 5 most recent policy pages sorted descending by effective date. 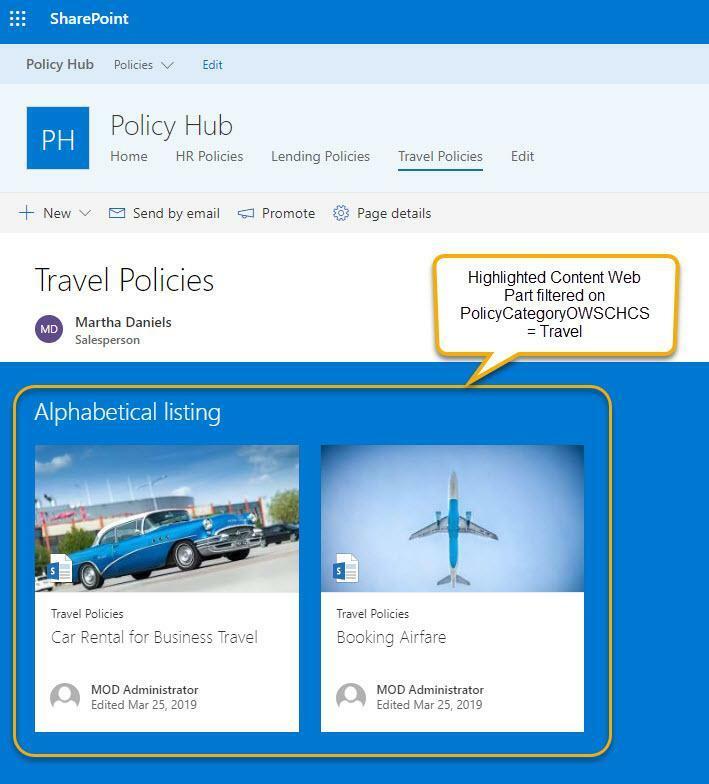 Build 1 page for each policy category using the Highlighted Content web part filtered on the managed property, PolicyCategoryOWSCHCS, to be either HR, Lending, or Travel. This is what the filtered Policy pages look like on the Policy Hub for Travel Policies. Don’t forget about retention! Using a modern Communication site as the template, provision a new site called Policy Archive and join it to the Policy Hub site above. This site will be used to house all expired policies via a Microsoft Flow. In the Security & Compliance Center, create a new Retention Policy to retain everything for 7 years past the created date and then delete. Publish this retention policy to the Policy Archive site. This will ensure when Policy pages are moved to the Policy Archive site, they will be retained for 7 years and then automatically deleted! All types of policies will be moved to this site when they expire, each with a different policy category. Create a view of the library to group/filter based on policy category. 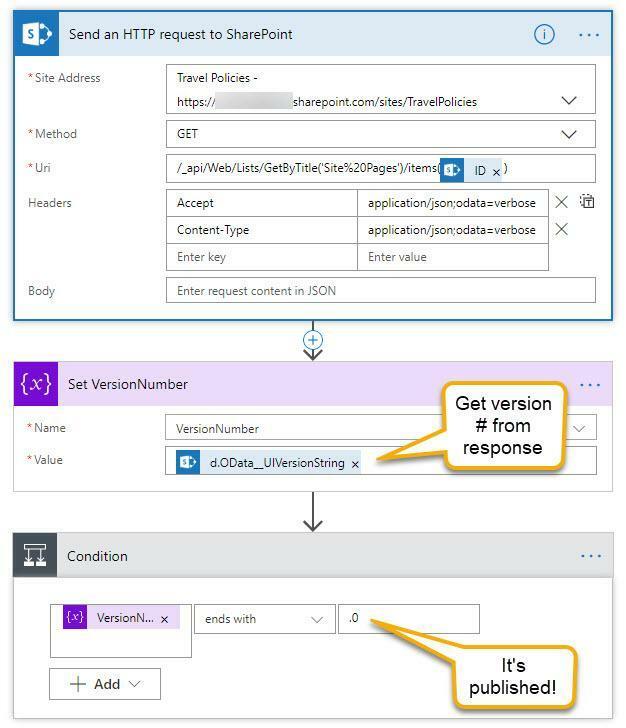 A daily Microsoft Flow will run to move any published Policy pages whose expiry date has passed to the Policy Archive site. This Flow determines if the page is published and, if it is, checks if the expiry date has passed. 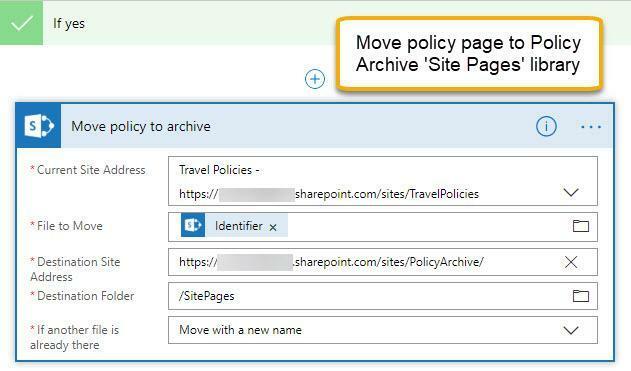 If it has, it will use the new Move file action in Microsoft Flow to move the page from the Policy site to the Policy Archive site. Here is the pertinent part of the flow to determine if the page is published and then move it. These steps are executed if the policy expiry date is less than or equal to today. I hope you found this post helpful in demonstrating many of the modern capabilities in SharePoint and that it sparked a few ideas of your own! Although I demonstrated Policy management with modern pages, a similar technique could be used for managing, communicating, and retaining other information with either modern pages or documents.  MVP, SharePoint and Office 365 Consultant As an owner of NexNovus Consulting, Joanna works with clients of all sizes and industry verticals in both SharePoint On-premises and Online.  She provides clients with clarity about the benefits of SharePoint, Office 365, building sustainable site and information architectures.